In the early ’70s, on the crest of the cycling craze sweeping America, SWMBO and I each bought a Schwinn Varsity 10 speed with the idea of riding ourselves into shape (ha!). Although we never really did any serious biking with them, I started riding with some guys at work in the late ’70s. I quickly found out the Schwinn, although lighter than the balloon tire one speeds we’d grown up with, was woefully inadequate for much more than riding around the neighborhood. This thing weighed a ton! Note the auxiliary (“safety”) brake levers, the stem shifters, and the kickstand—sure signs of a low end bike. We probably paid about $120 apiece for them. 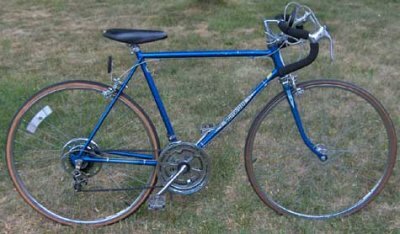 With the help of one of my coworkers, I got turned on to the Fuji America, a very nice upper end touring bike aroumd 1978. I think I paid about $400 for it, which was a fair chunk of change in those days. I rode it quite a bit, completing several metric Centuries (100 kilometers—about 62 miles) in the process, as well as several club rides and a lot of local pedalling about. I had gussied it up with a rear rack and a bottle cage. It had 700C tires (with Presta valves)—a new experience for me after the 1½" tires of the Varsity. It really was a sweet ride. Sadly, it was stolen out of my garage in 1981. Around 1984, I got my tail wagging again about riding, and flush with a fat back pay check, looked for a replacement for the America, which had been discontinued. 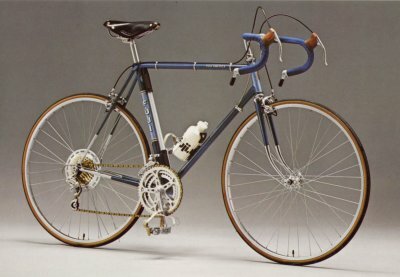 My localbike purveyor(might as well give him a link—he was always good to us) had this Touring Series IV, which had about the same pedigree as the America (both have quad butted, chrome moly steel tubing in a similar geometry), with some minor differences. Where the America had a Brooks-like leather seat, my TS-IV has a more modern composite. 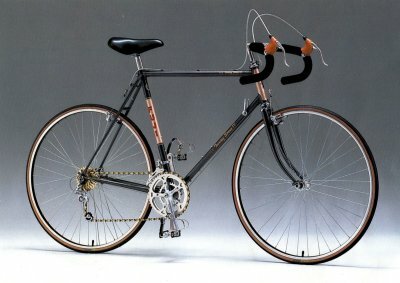 The America had bar end shifters, whereas the the TS-IV has down tube shifters. There are three sets of lugs for water bottles on the TS-IV—I only remember one on the America. The TS-IV has a built in chain holder on the inside of the seat stay and two spare spokes on lugs on the left side chainstay. I only recently discovered those last two features, so it should come as no surprise that I couldn’t tell you if the America had them or not. The TS-IV has a triple chain ring (50/45/28) and six cog (14-16-18-21-24-28) cluster—18 speeds. I thought I had remembered the America as 3×5—15 speeds, but recently I’ve found literature that it was a 3×6, also. Oh, and in that five year period, the price went up a few hundred dollars. The pictures of the IV, the America above, and the Sagres below are actual Fuji literature images. The Varsity on top, is not mine/ours, but is virtually exactly like the ones we had (although my Schwinn was yellow and SWMBO’s was green). I can’t recall if I had any racks on my America—I have a rear rack on my IV but no pannier rack, and I also have a handlebar bag on it. I have a Sanyo Dyna-Power between-the-stays generator, aong with lights. The Schwinn had a sidewall generator, as I suspect, did the America (can't remember). Around the same time, SWMBO decided to upgrade her Schwinn (by now I’d been out of mine for > five years) and for her needs our local bike purveryor suggested this Fuji Sagres in a mixte frame (SWMBO insisted on no “men’s” frame, despite their greater strength than the traditional “women’s” frame—the mixte frame was a great compromise). It wasn’t as expensive as my TS-IV, but it wasn’t cheap. 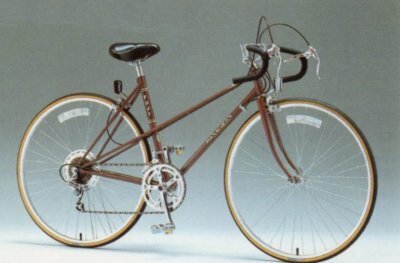 Hers is a burgundy color (although the original literature calls it Ruby Red—not at all as seen here), and due to her complaints, the rondeau handlebars were replaced with upright bars. It has a 52/42 chainring and a six cog (14-16-19-22-26-30) cluster. We don’t think it ever had “safety” brake levers, although the dealer might have taken them off for us before delivery. She also has a handlebar bag as well as a nice rack (I love saying that). Our oldest inherited one of the Schwinns (the other was sold) until we bought her, too, a Fuji (don’t remember the particulars), and the younger got a series of progressively larger bikes as our family biking developed. We sure had a lot of fun on those. Elroy/Sparta and Sugar River Trails, and Door County in Wisconsin, Great Western and Fox River Trails in Illinois (a lot—we lived in the area), Mackinac Island in Michigan, and a host of other local rides in the county, many times with friends, made for some fun packed family experiences. Recently (2007 or thereabouts), I took the TS-IV into the local shop to have a tune up after not having ridden it for nearly ten years. At first the owner asserted I’d never ride it again (due to age—mine) and tried to convince me that I needed a side walk cruiser or multi use bike. When I went to pick it up after he had had his hands on it, he had changed his tune completely and told me what a pleasure it was to work on a bike of that quality. As I write this, we’re in the middle of the Tour de France, and I’m starting to get out with it to try to get some biking legs back. It’s a pleasure to ride. And my old CatEye Solar computer still works, too. A new Bell helmet to replace the antique Bell I bought in 1978, and look out pedestrians! Further update: I’ve been poking around the ’net and discovered that our Fujis are now considered vintage, and are referred to as “steel bikes” due to their (in our cases) chrome-moly steel tube construction. Modern bikes are apparently largely aluminum or composite. Also, I’ve noticed several references to our old bikes as from the “BB” era referring to that time in the ’80s when there was a bike boom going on. All very interesting.